Figure 1. 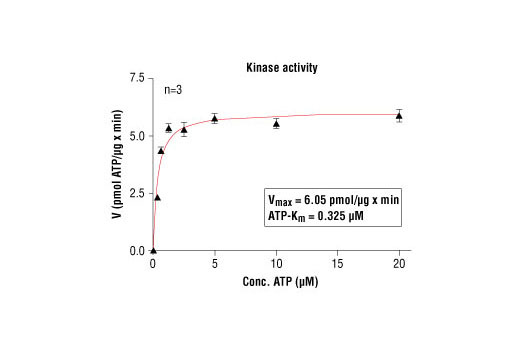 PKCtheta kinase activity was measured in a radiometric assay using the following reaction conditions: 60 mM HEPES-NaOH, pH 7.5, 5 mM MgCl2, 1.32 mM CaCl2, 1 mM EDTA, 1.25 mM EGTA, 0.25 μg/50 μl Phosphatidylserine, 50 ng/50 μl 1.2 Dioleyl-glycerol, 1.2 mM DTT, ATP (variable), 2.5 μg/50 μl PEG 20.000, Substrate: Histone H2B, 2 μg/50 μl and recombinant PKCtheta: 200 ng/50 µl. The kit provides a means of performing kinase activity assays with recombinant human PKCtheta kinase. It includes active PKCtheta kinase (supplied as a GST fusion protein), a biotinylated peptide substrate and a phospho-serine/threonine antibody for detection of the phosphorylated form of the substrate peptide. Peptide substrate, Biotin-peptide: 2,326 Daltons. GST-PKCtheta Kinase domain: 110 kDa. PKCtheta is expressed in a relatively selective manner in T lymphocytes and is essential for the activation of mature T cells. PKCtheta is also expressed in muscles cell and may play a role in regulation of insulin sensitivity (10). Altman, A. and Villalba, M. (2002) J. Biochem. (Tokyo) 132, 841-846.